I have been tweaking this pattern since I first posted it some two years ago. I think I am happy with a couple of improvements so I am adding it again. The biggest improvement is a little hack for making smooth KFB. 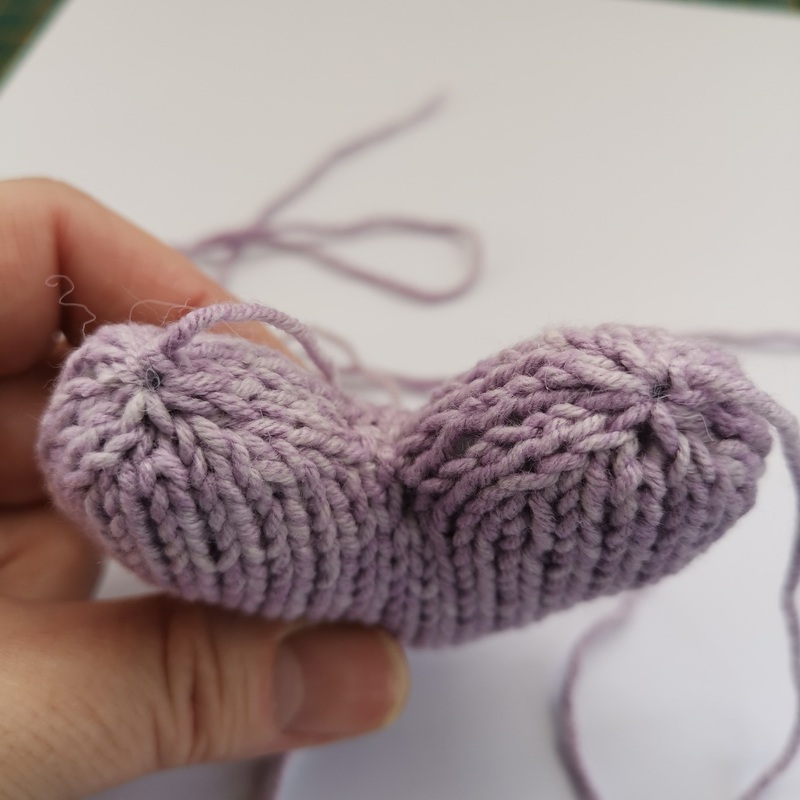 I have seen it a few times in various places – I think it is abbreviated as KFSB, or Knit Front, Slip Back. 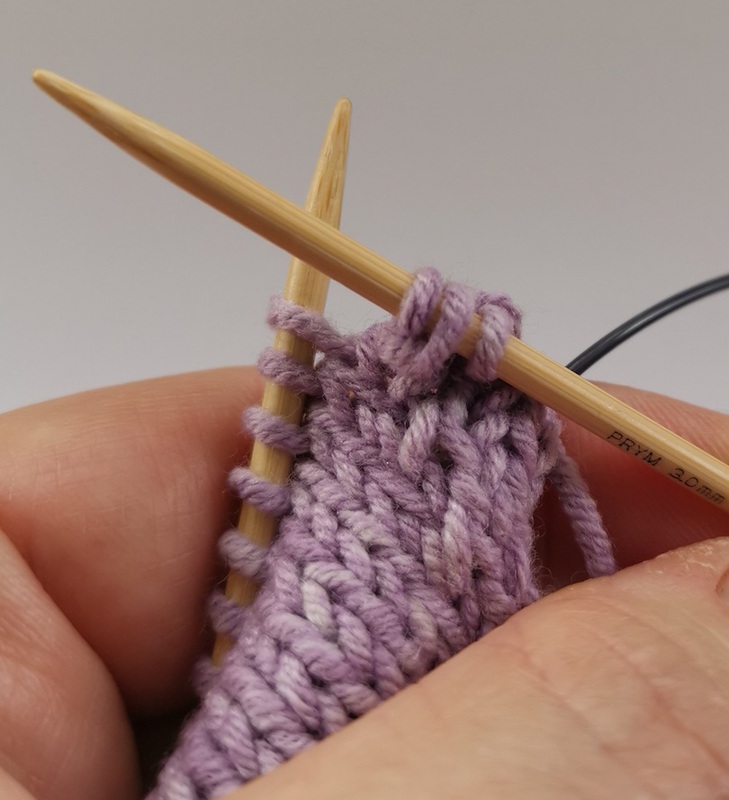 Instead of knitting, you simply slip that loop over to the right needle. You have still made another “stitch” (see the three loops where once there were two?) but it looks so much better and it is just a bit faster! The resulting increase is also a bit smoother that the usual KFB. The harsh straight bars that you get with a KFB (and you can see a little trio of them in the smaller heart-tip) are instead a more gentle, angled bar. 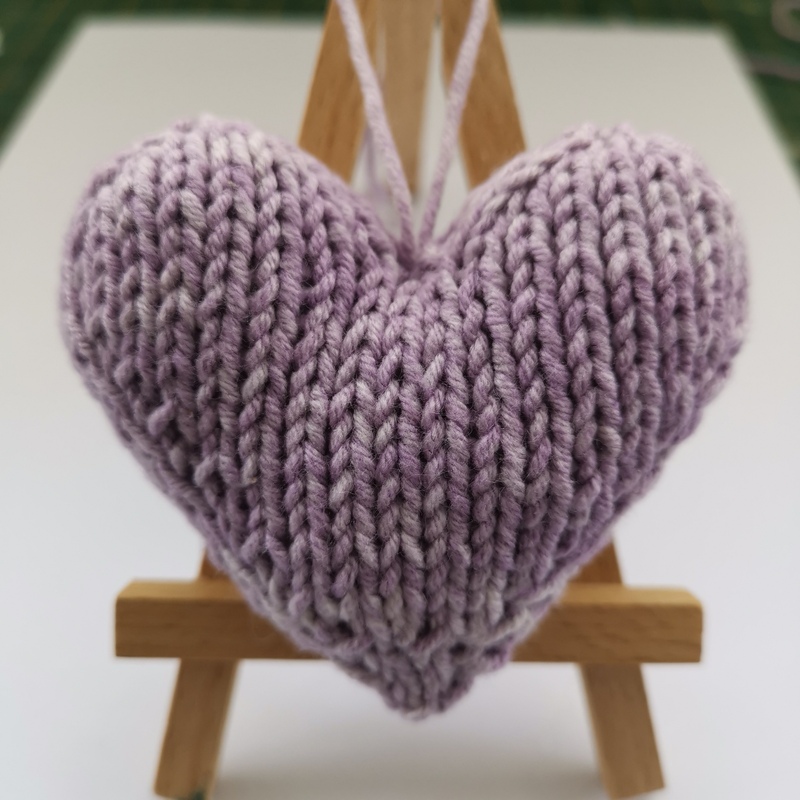 I have taught this heart to a few people, and one aspect that occasionally give people trouble is working on the two “heart bumps” so I thought I would redo the photos for that and practice with my new phone’s camera. 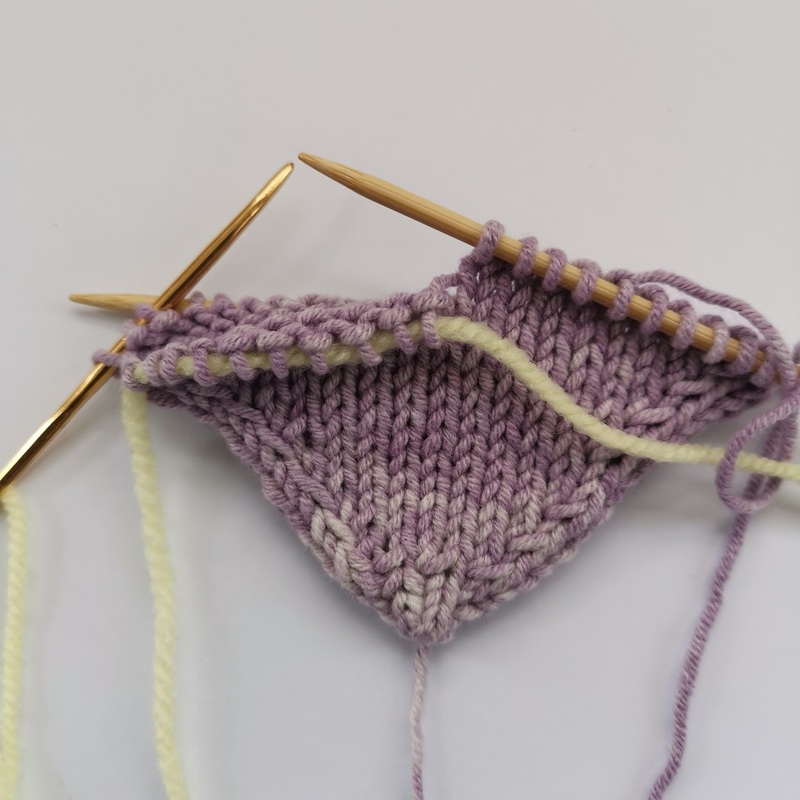 Knit the first 10 stitches on the front needle. 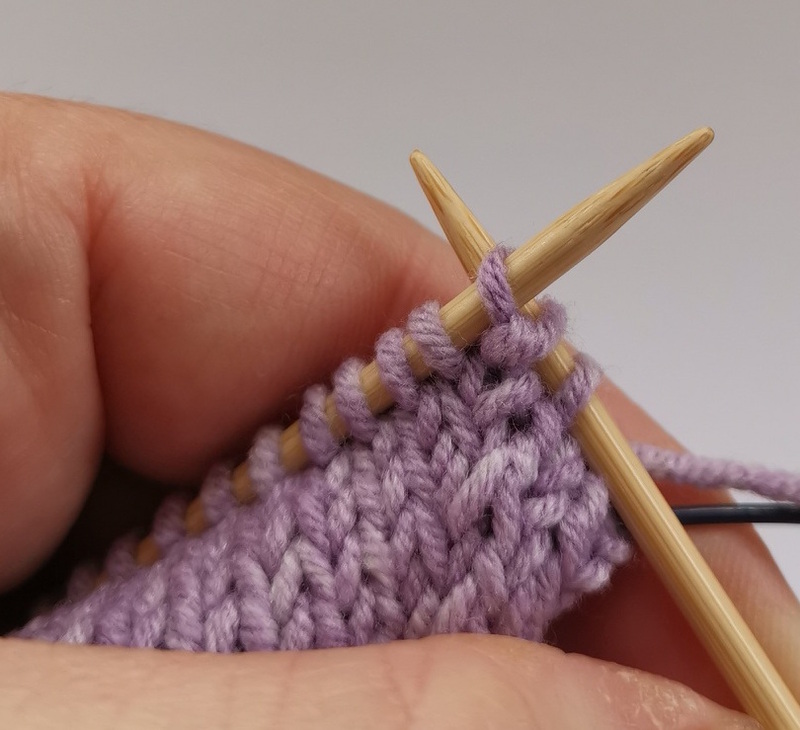 Slip the last 10 stitches onto some scrap yarn – in this case scrap yarn is a better choice than a stitch marker! 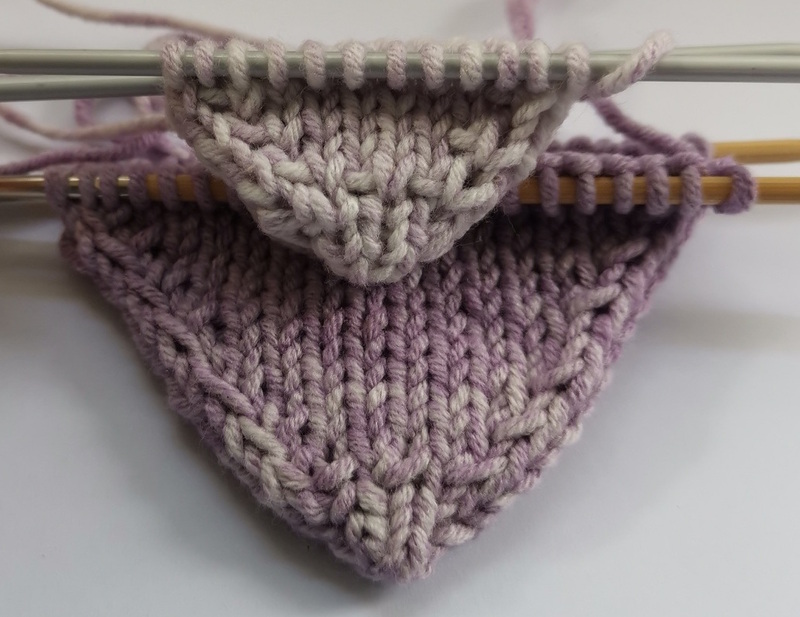 It is a lot less likely to get in your way, because now you will knit only the 20 stitches on the right, 10 on the front needle and 10 on the back. 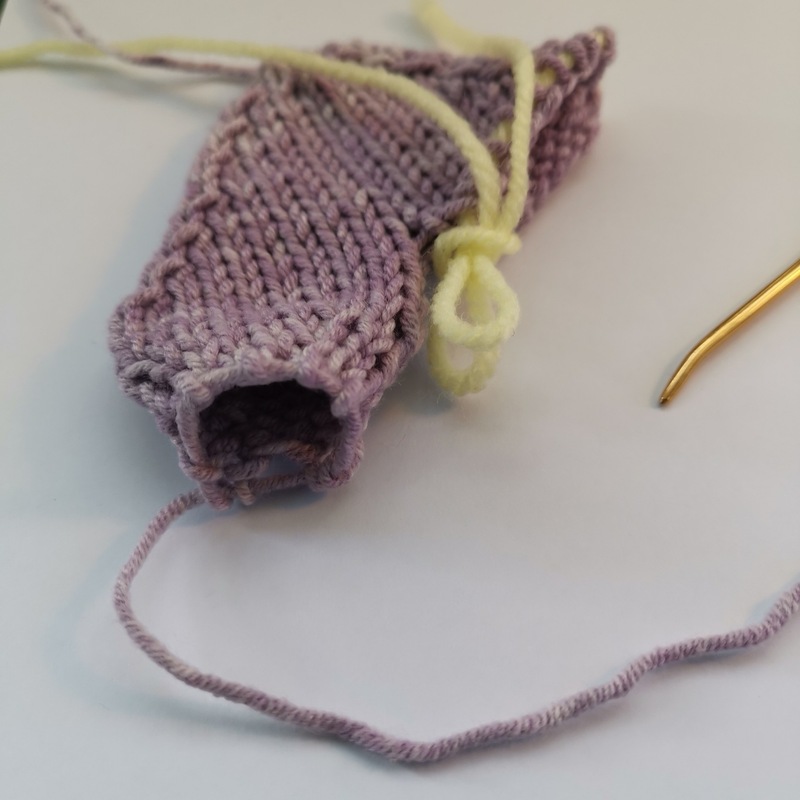 Once you knit to the end of the heart bump section, cut a long tail and thread a big-eye needle. Run the end thru the live stitches but DO NOT GATHER. This is where you will stuff. 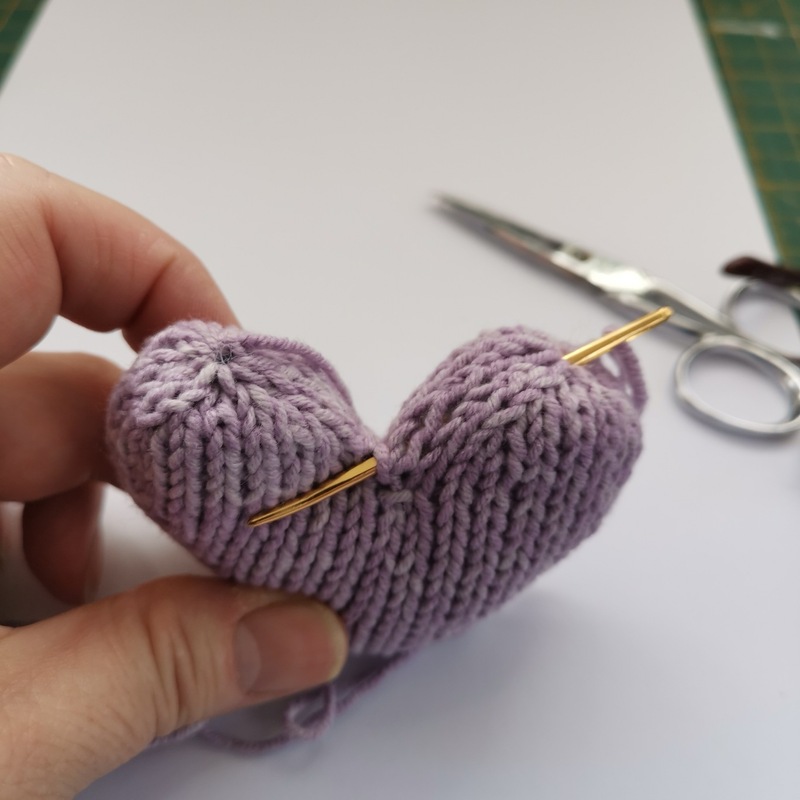 Now, thread the new yarn end onto your needle and (here comes the sewing bit) make a stitch or two to close the gap in the V of the heart. Secure this so when you begin knitting it doesn’t loosen up. 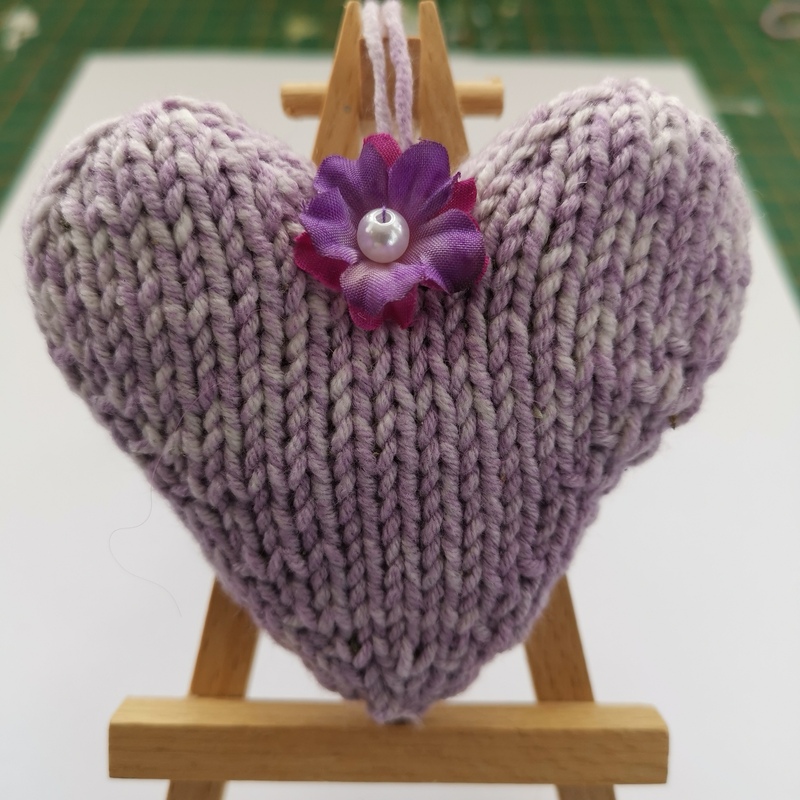 Now, working on the final 20 stitches, knit a round then repeat the instructions for the original heart bump. 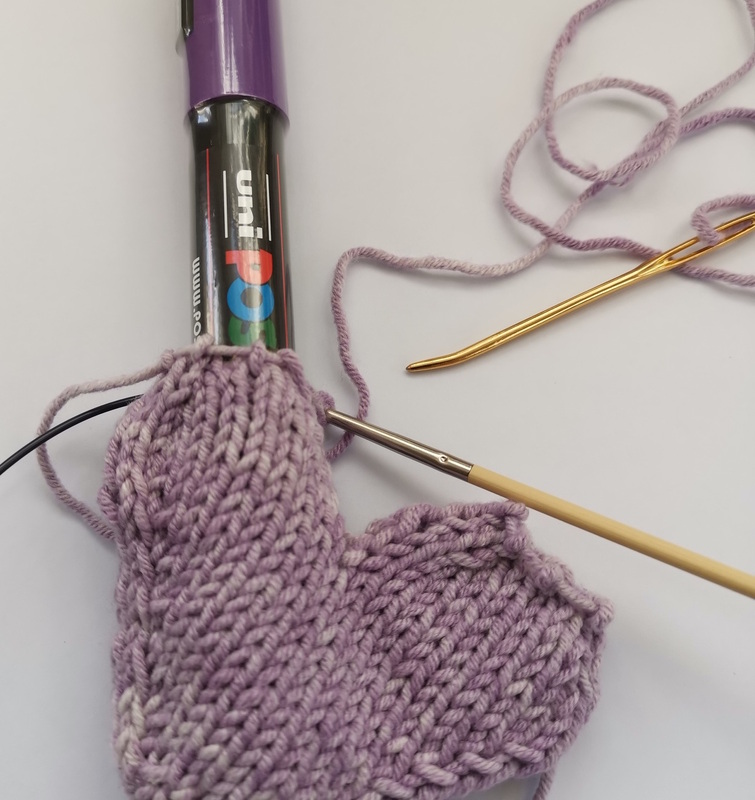 If you are struggling to keep the final few stitches from gathering, slip a fat marker into the opening. Stuff the heart and gently gather the two tops. 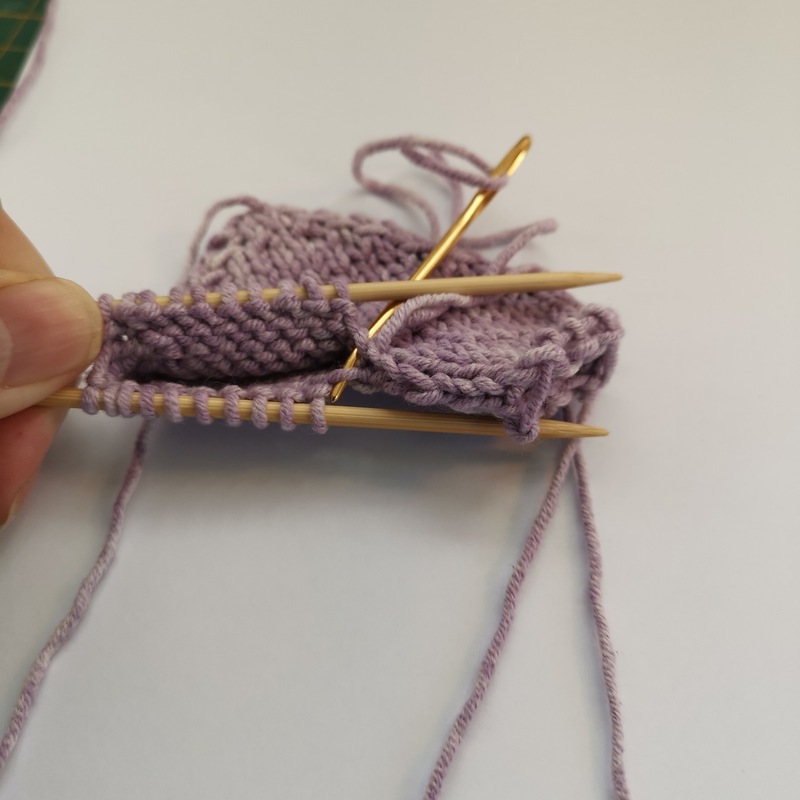 Either secure and weave in the ends OR thread each one thru your needle, insert and exit thru the centre V to create a hanger. I’ve been stuffing them with lavender from our garden! Did you know lavender repels the clothes moth? I have spent too much time knitting socks only to sacrifice them to a hungry moth! Here is the new pattern. Hope you enjoy it! Categories: knitting, Uncategorized | Tags: knitting, pattern | Permalink.